Our gut’s health is so central to our wellbeing. Have you been looking for ways to improve your gut health, or simply feel terrible all the time and don’t know why? Having a healthy digestion affects our overall health and below are 8 ways you can improve your gut health today. Having a healthy gut biome is critical to a properly functioning body. So some of the symptoms of an unhealthy gut, occur elsewhere in the body. All of these things can be attributed to poor gut health. Luckily I have some answers for you! There are ways that you can improve your gut health. There are around 40 trillion bacteria in your body, most of which are in your intestines. Certain types of bacteria in your intestines can contribute to many diseases. You can control what bacteria you grow by what you eat! Here are some ways that will both improve gut health as well as your overall health. There are thousands of species of bacteria in your intestines. Each one plays a different role in your health and requires different nutrients for growth. The most effective way to improve your gut health is to improve the balance of good bacteria in your gut. A nice and diverse, well balanced microbiota is considered to be a healthy one. This is because the more species of bacteria you have, the greater number of health benefits they may be able to contribute to (1, 2). A diet consisting of different food types can lead to a diverse microbiota (3). Sadly the standard Western diet is no longer very diverse and is super rich in fat and sugar. A few studies have shown that gut microbiota diversity is much greater in people from rural regions of Africa and South America than those from Europe or the US (4). So the first way to improve your gut health is to simply increase the variety of foods that you eat. Now of course, eating a variety of foods doesn’t mean make sure you eat both burgers AND ice cream! What I really mean is eat more variety of real foods. Plants are the best sources of nutrients for a healthy microbiota. If you are serious about improving your gut health you need to eat a range of vegetables, fruit, beans, legumes and some grains. They are high in fiber, which can’t be digested by your body but it can be digested by certain bacteria in your gut, which stimulates their growth. Apples, artichokes, blueberries, almonds and pistachios have all been shown to increase Bifidobacteria (the good guys) in humans. Many of these foods are rich in lactobacilli, a type of bacteria that benefits your gut health. Yogurt is a fantastic way of introducing probiotic foods to people as it is delicious and easy to make, you don’t even need a yogurt maker. You can even make it with goats milk, or coconut milk and even make it with a dehydrator! You can also make your own sour cream with your yogurt. People who eat a lot of lactobacilli foods have fewer Enterobacteriaceae, a bacteria associated with inflammation and a number of chronic diseases (5). However, it is important to note that many yogurts, especially flavored yogurts, contain high levels of sugar, these are to be avoided. Artificial sweeteners are widely used as replacements for sugar. I find I can taste the bitter after taste and don’t like them. Also some studies have shown that they can negatively affect the gut microbiota. One study showed that rats fed aspartame (one type of sweetner) had higher Clostridium and Enterobacteriaceae in their intestines, both of which are associated with disease when present in very high numbers (6). We have all heard of probiotics, but have you heard of prebiotics? Prebiotics are foods that promote the growth of beneficial microbes in the gut. They are basically fiber or complex carbs that we cannot digest. Instead, certain species of bacteria break them down and use them for fuel. Plant foods like fruits, vegetables and whole grains all contain prebiotics. Studies have shown that prebiotics can promote the growth of many healthy bacteria, including Bifidobacteria. I am not a fan of eating grains in general. Don’t get me wrong, I love sourdough bread (and cake). I just don’t think we should routinely eat huge numbers of grains in our diet. They do not contain anything that we could not get from other sources. In saying that though. Many traditional diets successfully eat grains without issue. What do they do that is different? They only eat WHOLE grains. Whole grains contain lots of fiber and non-digestible carbs, such as beta-glucan. They soak or ferment their grains before consumption. This both increases the bioavailability of the nutrients and good bacteria while simultaneously reducing the phyates that act as minor toxins to those that consume them. Whole grains are not absorbed in the small intestine and instead make their way to the large intestine. There, they are broken down by the microbiota and promote the growth of certain beneficial bacteria. Polyphenols are plant compounds that have many health benefits, including reducing in blood pressure, inflammation, cholesterol levels and oxidative stress. Polyphenols can increase the quantity of Bifidobacteria and lactobacilli (good) in humans, as well as reduce the quantity of Clostridia (baddies). If you are sick from a sick gut, a gut that is not functioning properly any more and you have been like this for a while then you have some healing to do. Your intestines can take months to heal from years of damage, and until they are functioning right again, you are not absorbing the nutrients that you need to function well. Add in probiotic foods as above, if you cannot make them yourself then you could use a top quality probiotic capsule. Be wary of cheap supplements, they are not worth the money. Buy from reputable brands that check their quality often. You will also benefit from liquid B vitamin, a liquid magnesium, a liquid mineral supplement, and L-glutamine. Why liquid supplements? They are simply easier to swallow and quicker to absorb. L-glutamine, an amino acid, is especially powerful in helping to heal the gut. Studies have shown that it is essential to repairing damage in the intestines (source). It also has some other benefits, like muscle growth promotion, curbing cravings for sugar and alcohol, improving blood sugar and fighting cancer, just to name a few. I have spent years and countless hundreds (maybe thousands?) of dollars trying to work out a way to help both myself and my husbands sick guts. 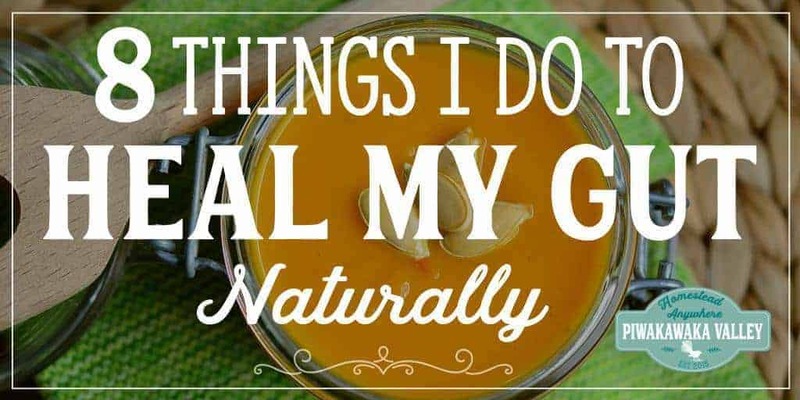 Naturopaths, doctors, medication, books, courses, supplements, fancy foods…. the list goes on. I wish I had known about the Gut Health Bundle much sooner! It has sooooo many amazing resources, several of which we have bought on their own previously. Many of them sell individually for more that what you can get the whole bundle for! The Gut Health Bundle contains 25 eBooks, eCourses and videos worth $695USD for an amazing $47! It comes with a 2 week starter menu plan and all sorts of goodies. I have loved watching the videos, and it is very enlightening to look at our own personal trigger foods. You can read more about the bundle here. What have you done to improve your gut health? Has it helped? Tell me about it in the comments below!